Rajendra K.C. is a modest man who allows his brushes to deliver most of his expression. An outdoor or “plein air” watercolorist, he can be found at the Falls Church Farmers Market many Saturdays during the year or at many other locations around town. Wherever he paints, a crowd gathers to admire his craft. Growing up in Nepal, Raj enjoyed playing in the beautiful Kathmandu Valley which he later chose to paint. 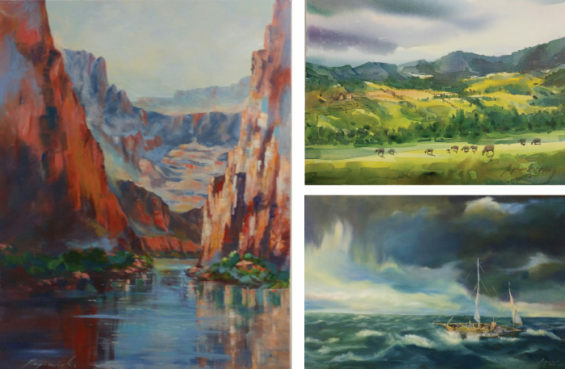 The green valleys and the mountains were awe-inspiring – he says that “nature is the first art teacher.” In fact he says he is a self-taught artist with no academic art credentials. As a high-schooler, Raj loved to paint but was unsure of his ability. After Raj graduated from high school, his younger brother entered a school contest, surreptitiously submitting one of Raj’s paintings as his own – and won first prize, 300 rupees! At that point Raj started to believe he might have some talent. He took a two-year course from Sirjana Contemporary Art Gallery in Kathmandu where he later exhibited a number of times. In fact Raj has been a part of numerous exhibitions around Nepal, India, Japan and beyond. At 35, Raj and his new wife, Shanti, took their young family (daughter Sara, then 5, and son Sheraj, then 3) to America traveling on a diversity visa and arriving in Falls Church. His first priority was surviving in this new environment so he worked full-time but painted when he could for he truly “wanted to contribute to the art field.” Still somewhat insecure about his painting being accepted, he recalls painting quietly at Great Falls National Park hidden by the trees. Two couples discovered him and stayed for more than an hour, fascinated by his work. It was time to make his passion a career pursuit in this country. Over time Raj has become more and more a fixture and a favorite in the city, participating in FCA artist exhibitions where he has won the 2012 Plein Air first prize, Plein Air People’s Choice award for 2013, 2014, 2015, and 2016, Plein Air Second Prize for 2014, 2015, and 2016, as well as the 2016 Artist’s Choice award. Ever humble about his art (“I hope I’m doing well”), he is extremely grateful to Falls Church Arts especially Barb Cram and Joe Wetzel, as well as the people of Falls Church who have accepted him and his art. In fact he always insists on taking a photo with each person who buys his work. 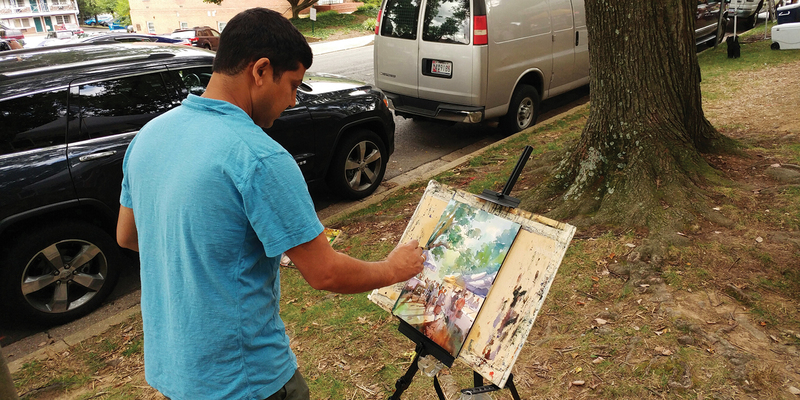 Raj loves to paint outside whenever he can, but he also maintains a studio at Tom Gittens’ Art and Frame as one of the Jefferson Street Artists. He tries to paint at least two to three hours a day if he can. He now thinks of his art as his full-time work while his other job is just part-time. He has just wrapped up an FCA class in Intermediate Watercolor at the Falls Church Community Center. Students there learn how to use color and how to make landscape paintings from one of the area’s best.